They have come from beyond our cosm. But do they bring Earth's salvation ... or its ultimate doom? The Possibility Wars spread across the face of Earth in the Near Now, twisting and transforming our reality into that of someplace else. Now the message sent by the lighting of the Signal Fire has been answered by beings from beyond our cosm. They call themselves the Akashans, but to the ancient Incans, they were the “Space Gods”, visitors from the skies who led the South American Indians to greatness before disappearing. 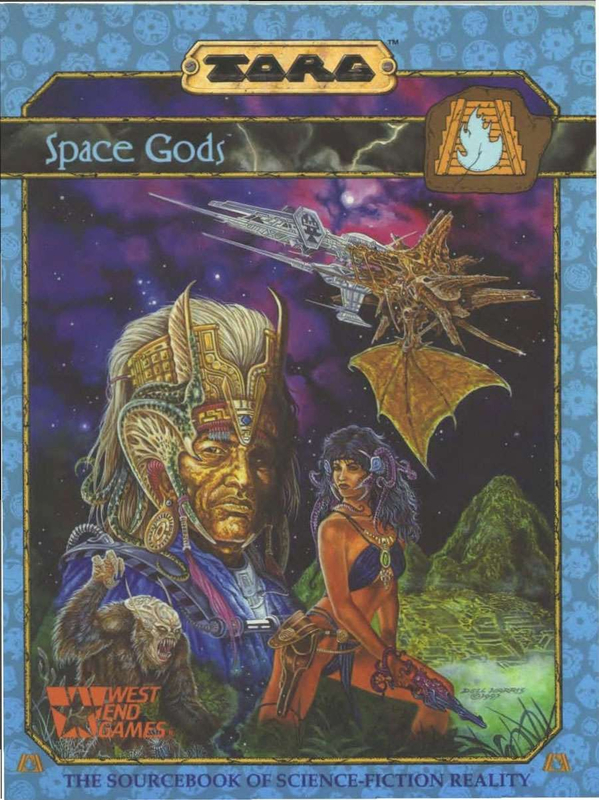 The Space Gods Sourcebook is part of Torg, an epic game of adventure, magic and altered reality. This volume describes the science-fiction reality of the Akashan realm, where biotech, psionics, and non-invasive reality combine to make a unique campaign setting. It features source material on the Akashans, the Comaghaz plage, the Star Sphere, and the realm. Included is gamemaster material on biotechnology, psionics, Akashan reality mechanics, world laws, locations, creatures, and new character templates. Add this classic RPG to your collection - Torg is a genre-spanning rpg where fantasy, cyberpunk, pulp, etc. all mix together. Now complete available as PDF! This title was added to our catalog on July 17, 2014.